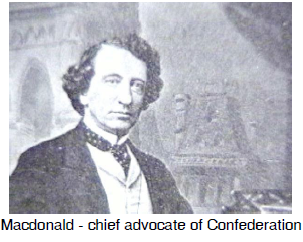 John A. Macdonald was born in Scotland and came to Canada as a young boy. He trained as a lawyer and had a practice in Kingston, Ontario. At first he took on difficult criminal cases, but later became the lawyer for financial institutions and corporations. He was also active in land development and speculation. In 1844 he entered provincial politics becoming a member of the Assembly of Canada West. He held the position of Provincial Secretary in the coalition government of 1864 and attended the Charlottetown and Quebec Conferences emerging as leader of the movement for Confederation. He continued the tradition established by Baldwin and LaFontaine of governing through a French-English partnership in his alliance with George-Étienne Cartier. Macdonald was conservative in politics, but expansionist in economics. He supported the new economy, the development of the railway and the opening up of the west. His dealings with the Indigenous people there showed that he was quite racist in his views. He became the first prime minister of Canada in 1867 and except for one term from 1874-1878, he served as prime minister until his death in 1891. Macdonald was known to be quite a drinker, favouring clear gin in his parliamentary water glass.